A ceremony of consecration of the newly-restored and opened edicule over the Lord’s Tomb in Jerusalem was celebrated today by His Beatitude Patriarch Theophilos of Jerusalem. The ceremony was also attended by His All-Holiness Patriarch Bartholomew of Constantinople, and representatives of the Roman Catholic and Armenian confessions, which keep watch over the shrine in concert with the Orthodox Church of Jerusalem, reports RIA-Novosti. 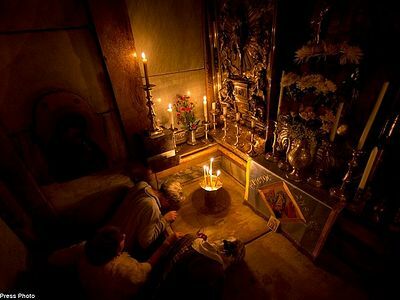 “The restoration of the edicule concerns not only Orthodox Christians, but the whole world. The shrine will remain for future generations,” said Patriarch Theophilos. During his speech he thanked all the benefactors who offered financial assistance towards the sepulchre’s first restoration in 200 years, including King Abdullah II Ibn Hussein of Jordan, head of the Palestinian National Authority Mahmoud Abbas, and Greek Prime Minister Alexis Tsipras. The Church of the Resurrection in Jerusalem was founded by Sts. Constantine and Helen in 336 AD. The basilica was destroyed in 1009-1021 under the Al-Hakim Islamic Caliphate, and restored in 1042-1048 by Byzantine Emperor Constantine Monomakh, with a new structure being built around the tomb. In its current form, the edicule was built in 1810 after a fire broke out in the church. 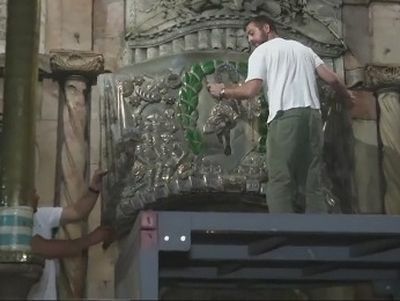 The restoration work lasted nine months, during which specialists were able to reinforce the walls of the edicule, thus removing the metal structure that had been protecting it for decades. 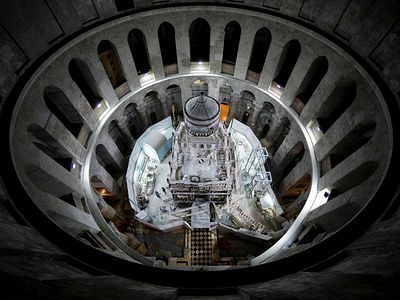 And at the heart of the heart of the edifice, in the center of the Church of the Holy Sepulchre in the Old City of Jerusalem, they will lift the slab where millions of pilgrims have knelt and prayed, where the salt of tears and the wet of sweat have smoothed and worried the hardest stone.